When using Activiti Explorer, all of the supported form properties have specific renderes that know how to render that form property type. Eg. 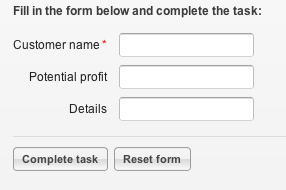 a date form property will be visualized using a date picker, a number property must be checked on validity, etc. A question we often hear on the Activiti Forum is how to add new form property types and render them in Explorer. And actually doing that is very easy. 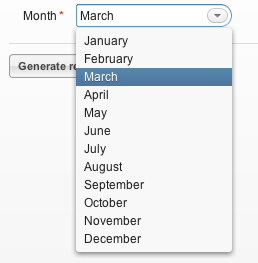 Let’s start with a simple example: we want to add a form property type that allows the user to select a month. Visually, we want to use a dropdown menu for that on the UI side of things. To understand this code, you just have to keep in mind that for the FormService, everyhing is a string. This is done so it is very easy to include in your own UI technology. The FormType class itself, like the one above will do the actual conversion to real objects. The convertFormValueToModelValue method implements the conversion from the form to the internal object. Here it’s very simple, we assume the value stored in the form is an integer which is the number of the month. The other method, convertModelValueToFormValue is the other way around. Since we just use the month index as model value here, that’s also pretty easy. In the code it is easy to see how that is done: we simple set the caption to the month name and store the index as value. In our messages.properties file, we do need to have entries like ‘month.0=January’ to make this work. The previous example was of course pretty easy. Let me show you how you can create a more complex form type. In the following example, we want the user to select a process definition from a drop-down. 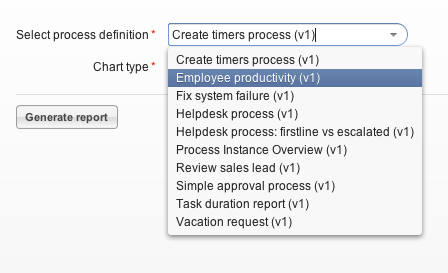 We must now make the user select a process definition from the dropdown, and send the process definition back and forth. Keep in mind that the renderer only keeps the process definition id’s as values, not the process definition objects. The object is only retrieved by the ProcessDefinitionFormType class above when the user actually submits the form. That’s all there is to it to create custom form properties. Happy Coding! I think I’ll use this feature more than once. This works for me. But is there any possibility to use form values (like used for enums) in my form renderer? @Mathias: sure, why not? You can query anything what you want to have it displayed. @Joram: I don’t know if I understand you correctly. As far as I can see, queries always refer to instances of process definitions, task definitions or something like that. In my case I want to have a new data type which can be used in potentially every process or task. Basically the idea was to implement a new data type “rstring” which should be a string validated against a regex. The regex should be provided with a form property holding the regex. My approach was to implement something analogous to EnumFormType but the mechanism how the values map is filled by the BpmnParser/DefaultFormHandler/… is rather complex and deep in the code. @Mathias: ok, i sort of understand now. The EnumFormType isn’t that hard: extends the AbstractFormType and plug it into your process engine configuration. However, the tricky bit will be to have dependencies between the form fields (ie your regex field and the actual field), as I don’t know if the current code is capable of doing something like that. Using this we can develop any kind of form element. Can you please share how can we design a radio button. and use them in form. My Eclipse complains about AbstractFormPropertyRenderer. I then had to google and found the answer that the AbstractFormPropertyRenderer is from activiti-explorer.jar which is not stored in Maven repo. Now I still have the error “Field” (in public Field getProeprtyField) and then ComboBox and MonthCombobox. Theses classes are defined anywhere else? I just try to run the example to see how the whole thing works. However, where do I put the code? is it in the bpmn xml file? Or? The form property xml goes into the BPMN 2.0 file. Thanks, it’s well explained and worked right away. Now I have a suggestion if I may. Both the date and enum properties have extra parameters (datePattern and values). If we could have access to these parameters with custom properties, it would be great ! Thanks for the precision Joram. But I still have trouble getting the information. First of all I should have mentioned that I use the REST API to retrieve the form. But even using the normal API, I have a problem. When I import the XML file, datePattern is read by FormPropertyParser.parseChildElement. But when I deploy the file, it looks like the file is parsed again but this time datePattern has disappeared (xtr.getAttributeValue returns null whereas the other attributes are correctly read). So datePattern is null in the BpmnModel. I guess during deployment it’s the not the original file that is read but a version that is generated for the purpose? Sorry for the delay in responding (christman holidays). Do I misunderstand your issue? Joram, I am having a similar issue in that I am trying to create a radio button formtype(modeled after the EnumFormType). I can create the type no problem. I can create my process in the designer, set the type to ‘radio’ then I set the values as I would for an enum type. It saves out fine to the xml. I get a null pointer error. From what I can see by tracing thru the code only the enumtype has the values loaded. I have other custom types where I get the values dynamically from a database and that works but I really need to access the values stored in the process definition. @Joram, I realise what I presented was confusing. Then I want to retrieve the floors parameter. I’m open as how to pass it. It could be in a activiti:value tag, in a datePattern parameter or anything else, as long as I can get it. It is recognised (I added the entry in the configuration file). Alas I have no information in buildingType. The XML part of my previous post is not displayed. If you add new element to the schema (which is possible), you will also need to extend the BpmnXmlConverters i’m afraid, otherwise they won’t be picked up. Another hacky way could be to misuse the value element eg to store json, that contains both the ‘buildingType’ and the ’10’ value. Hey, I followed the same tutorial. Instead of using comboBox I rendered Table in my application. and given it name as “map” instead of “month” as demonstrated above. but while running this it says unknown type ‘map’ map. I think i am missing something please can you help?? @Akshay … have you registered it with the engine? That error seems to point in that direction. or do you mean it’s showing that in the UI? I’m facing the unknown type ‘products’ products error in the UI. I defined a ProductFormType and the renderer, did every step in this tutorial but still I get that error message in the activiti explorer UI.